By changing yarn and hook size when you crochet, you can drastically change the finished object you create. If you use a thicker yarn and a larger hook, you’ll end up with a larger finished object. Likewise, if you use thinner yarn and a smaller hook, your finished object is scaled down. 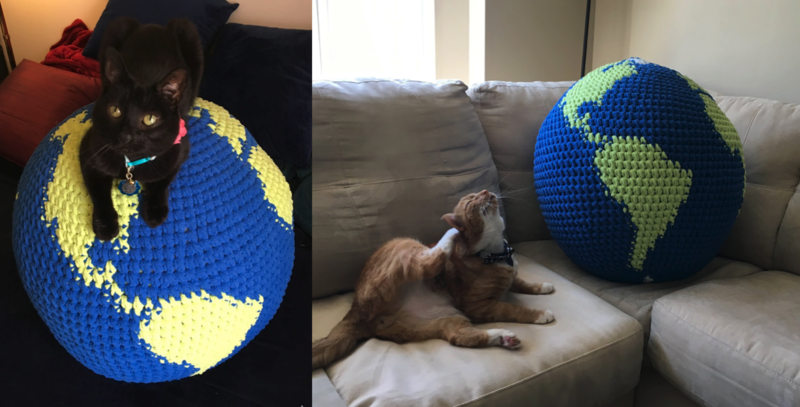 In honor of Earth Day coming up in just a couple of weeks, I’ve taken this process to the extreme with my mega globe pillow. This gargantuan globe is about 2 feet in diameter, with a circumference of over 6 feet! I can’t even wrap my arms all the way around it! By contrast, completing the same pattern with worsted weight yarn and a 3.5mm hook results in a globe that you can hold in the palm of your hand. For this 2-foot globe, I held two strands of Bernat Blanket together and used an 11.5mm crochet hook. For the hook, you just want to make sure the stuffing won’t show through your stitches. I like to crochet a few rows and then push some stuffing against the back of the work to check. If the stuffing shows through, you’ll want to try a smaller size. You’ll need a lot more yarn than you would for a small globe. This mega globe took about 710 yards of Royal Blue yarn, 270 yards of Lemon Lime, and 40 yards of White. In general, you’ll want to aim for about 2.5 times more blue than green, and a much smaller amount of white. You’ll also need a LOT of stuffing to fill such a huge globe. This pattern in particular requires you to really stuff it firmly to show the spherical shape. I used a whopping 15 lbs of Polyfil stuffing to fill out this globe. Luckily, you can buy in bulk online. What about a micro globe? If the mega globe is a little too big, you can also go to the opposite extreme. On the left below, you see the mega globe with a blu-ray case for scale, and on the right: a micro globe! 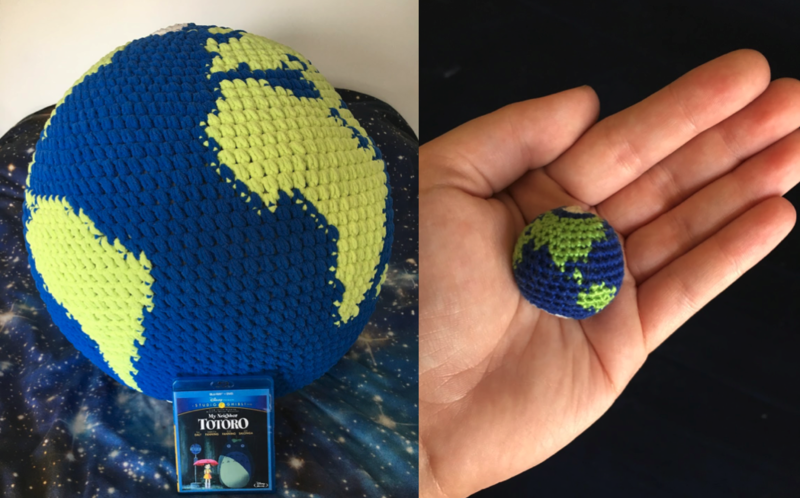 This palm-sized planet was made with the mini globe pattern, embroidery floss, and a 1.5mm steel crochet hook. 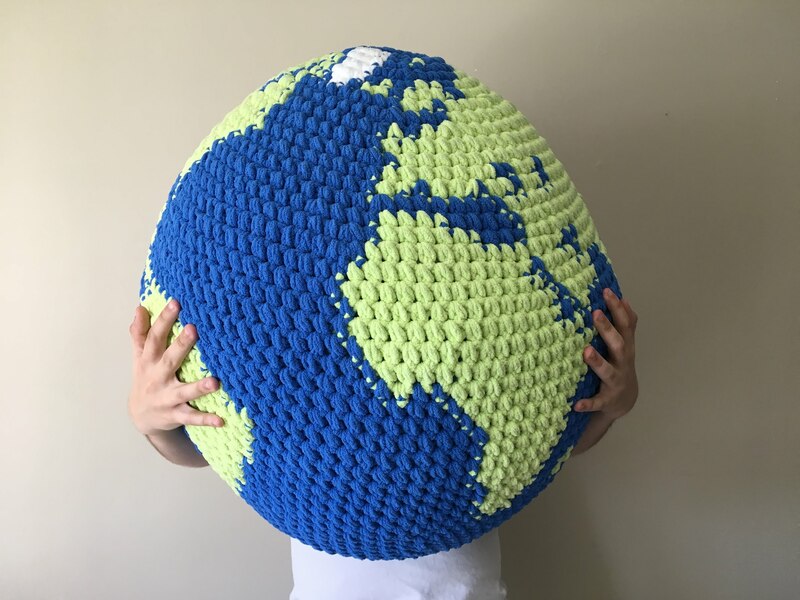 If you want to make your own globe (mega, micro, or otherwise), you can pick up the pattern in my shop for 15% off from now until Earth Day by entering the coupon code EARTHDAY2018 at checkout. This discount applies to: the large globe pattern, the small globe pattern, the combo pack of both globe patterns, and the world map mug cozy! Hi Veronica! It will look a little pointed until it’s fully stuffed, so if the end looks pointy keep stuffing it as best you can until it’s nice and round! The pattern is designed so that if you stuff it quite firmly it should end up a nearly perfect sphere, but it can be a little difficult to get it stuffed enough.